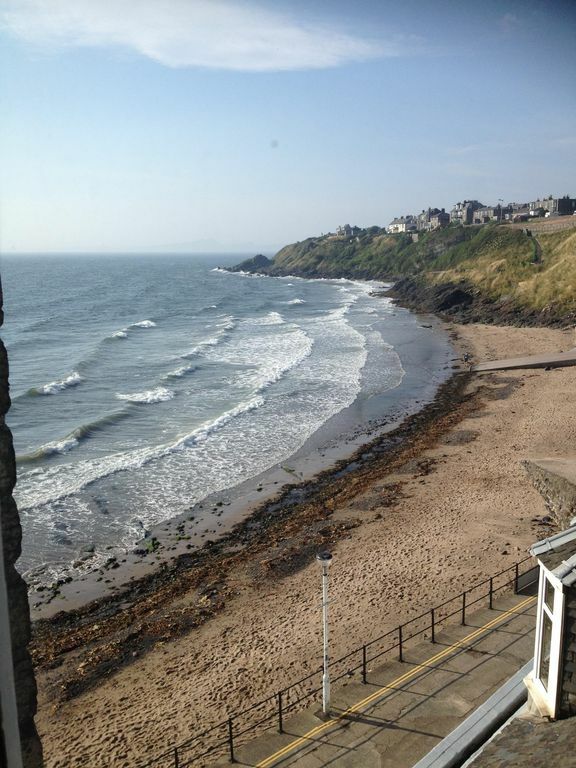 Beautiful , bright, 2 x bedroom seaside apartment in Kinghorn, Fife, Scotland. On the Fife coastal Path. Spectacular views across Firth of Forth to Edinburgh, Inchkeith island and Bass Rock. The apt comprises a light , airy and spacious lounge with magnificent sea and beach views, a double room with views over the sea, a large twin bedroom with views over the rear gardens, travel cot available, well equipped traditional dining kitchen with a Tassimo coffee machine, new bathroom with bath and shower. As it is top floor, the apt is not overlooked. Flat is on the 3rd floor of a 100 yr old block so not suited to pets or for people with mobility difficulties. Central heating, free wi fi and TV with multi channels, CD player,selection of DVDs. Parking is on the beach road or nearby free car park. Direct train to Edinburgh ,40 minutes over the magnificent Forth Rail bridge. Easy road links to St Andrews (home of golf) Perth and the East Neuk of Fife with its traditional fishing villages. The apartment is on the beach road so do what we do, take the deckchairs from the bottom of the stairs, walk across the harbour road , sit and relax on the beach with a glass wine and watch the world go by. Week long bookings only for July / August , Saturday to Saturday . Extraordinary Views in a Peaceful Seaside town! The views from this light-filled flat onto the beach and across the firth are spectacular! Well-furnished, casual, and commodious the location is fantastic for walking the beach, accessing the town, and hopping on or off the train. Getting to Edinburgh is about a 35 minute train ride away. Online taxis were easily available to get to the airport in the early morning. We found the sounds of waves and shorebirds to make for a restful and relaxing four day stay for four people. The owner was very responsive and helpful. We would definitely stay here again! This property is in a excellent location, especially for kids. The property is located right on the beach and within 6 steps one can be from the front door onto the sand. The flat was spotlessly clean and well stocked with every piece of furniture and kitchen equipment required for a self catering holiday. There are however plenty of places within the town itself and close by to eat out - no more than a 5 minute walk from the flat. The owner has gone out of her way to both welcome the occupier and provide masses of information of interesting places to visit, where to eat and available transport to Edinburgh and the Fife Coast. With two young grand children our holiday was a beach holiday and the owner provides all kinds of extras beach rugs and chairs being only an example. Speak to the local residents, they are very friendly and willing to stop for a chat, and full of local information. The beach shop is well stocked and very affordable so we found no need to return from the beach to the flat for snacks or drinks. The beach is clean and very safe and even in August was fairly empty of other families. The views from the flat are spectacular and take in Kinghorn Bay itself, with views across the Forth to Edinburgh. There is absolutely nothing about the flat, it's location or the local facilities that we could fault and both grandkids and ourselves enjoyed the week tremendously, it just passed far too quickly for us all. Thank you John and Brenda for such a glowing review ! Great location, very nice and tidy flat with a beatuful view to the ocean. We had great time and there is absolutely nothing to complain about. Fantastic! Perfectly situated and very homely. Nous avons adoré notre séjour : l’appartement est idéalement situé et très bien équipé et joliment décoré. Nous avons passé une semaine au calme a profiter d’un bord de mer et ses surprises (dauphins et phoques). Les commerces sont très proches et là gare pour Édimbourg très pratique. Emma a recommandé de belles balades et sites à visiter.